Police are appealing for information after money and jewellery were stolen in a robbery in Clayton. At about 10.30pm on Wednesday, April 1, a ground floor window was smashed on a property in Bradford Road. When the occupant came out to see what had happened, he was approached by three men who ordered him back inside. He was then assaulted and ordered to hand over money and jewellery. The men, who had their faces covered, then left on foot with a quantity of cash and jewellery, which included bangles, an earring and a chain. The victim suffered bruising in the attack, but did not require hospital treatment. The man who made the demands is described as wearing a black and grey tracksuit, which was possibly ‘Lacoste’ clothing. His ethnicity, as well as that of the two other suspects, is not known. 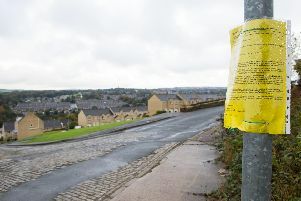 Detective Inspector Neil Benstead, of Bradford District CID, said: “We would like to hear from anyone who saw any suspicious activity in Bradford Road, close to the junction of Brecks Road and Crestville Road, at around the time of this incident. Anyone with information on this incident is asked to contact DC 6071 Mohan at Bradford District CID on 101 or Crimestoppers anonymously on 0800 555111.